Colombia is home to stunning cities, breathtaking natural beauty, wonderful beaches, coffee plantations, unique flora and fauna, and more. While it can be hard to choose a travel destination or activity from the country’s many must-see destinations, here are 10 things to see and do in Colombia that stands out among the rest. 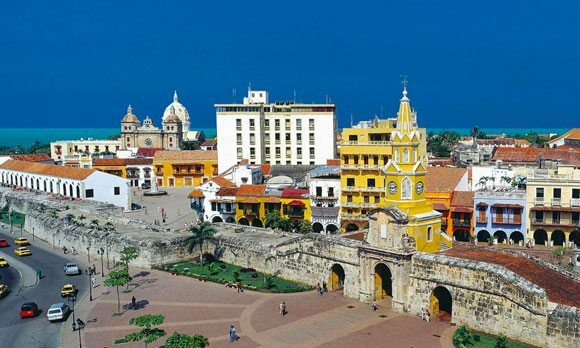 Tropical Cartagena, a modern port-city on the Mediterranean coast, is a must-visit on any Colombia trip. This is one of South America’s most charming and picturesque walled colonial cities, much-visited for its beaches. Life moves at a leisurely pace here, and no matter how troubled the Colombian capital or other regions of the country are you are bound to find people meandering along the cobbled streets, checking out the delicious local cuisine, enjoying its beautiful beaches or browsing the excellent city museums. The Old Town with its 16th century plazas is one of the biggest attractions in Cartagena, and one of the things you must do there is enjoy a sunset with a scrumptious cocktail in your hand at the Cafe del Mar. Another popular and highly recommended beach destination on the Mediterranean coast is Parque Tayrona, located about 34 kilometers from Santa Marta (an erstwhile Spanish settlement and natural harbor). Parque Tayrona or the Tayrona National Natural Park is a protected area at the foot of the Sierra Nevada de Santa Marta. Here you will find jungles and sea, sandy beaches along the northern coast to rainforests at 900 meters to the south. To the west, there are arid brown hills and cacti. The eastern and central rainforests are lush, verdant and home to at least 56 endangered species of wildlife. At the park you will also find some ruins of the Tayrona people, such as the town of Pueblito. The stunning coconut-palm shaded beaches are a big attraction, but they are not for swimming. You can snorkel and dive in some places, however, and equipment rental is available. Another historic city center (and world heritage site) is Mompox, or Santa Cruz de Mompox (mentioned by writer Gabriel Garcia Marquez in his novel “The General in His Labyrinth”). This old city was founded in the sixteenth century on the banks of River Magdalena, and had an important role to play in the colonization of South America by the Spaniards. The historic city center expanded along the river in the following two centuries. Today, you will find an old town that melds very harmoniously within its modern urban surroundings. One of the most striking buildings in town is the late sixteenth-century Iglesia Santa Barbara en Mompox, or the church of Santa Barbara, with its spacious interiors and striking tower. When in Mompox, you can explore the colonial architecture, watch the Easter processions, take a boat trip in the Pijino swamp, and learn about the art of goldsmithing and more. A sleepy town set in the foothills of the Colombian Andes; Salento is a popular getaway for locals and tourists from Pereira and Armenia on weekends and holidays. Located in the lush and relaxed mountains of the Quindio department, this town offers the perfect setting to explore Colombian organic coffee fincas (estates), visit the Kasaguadua Natural Reserve, try pig racing, enjoy some of the country’s best views at Mirador, eat Trucha (a local fish) and hike in the surreal natural cloud forest of the Valle de Cocora, where you will find towering specimens of the national tree – the wax palm. The Bosques de Cocora in the Cocora valley is a magical and remote wooded area with winding rivers, meandering paths and bridges, and plenty of breathtaking scenery. Salento is reachable by bus from the towns of Armenia or Pereira. If you are in the neighborhood of Pereira, be sure to stop by this small family-owned coffee estate for a wonderful tour of the farm, the process of making coffee, and also get a taste of some fresh brews. This estate is highly rated by visitors for its hospitality – Don Manolo and his family will take you around and explain the entire process of coffee making from pod to table. The friendliness and politeness carries over into the coffee that is usually brewed for visitors. Some visitors have also picked fresh fruit from the farm’s trees to have the hosts create delicious smoothies for them. This is a highly recommended experience as an alternative to larger coffee plantations in the region. There are few churches in South America that are built in such a precarious location as the Las Lajas Sanctuary, which dangles over a Colombian gorge in a forest near the border with Ecuador. There have been eighteenth-century stories of miracles that inspired the building of this church between 1916 and 1949 in place of the original chapel that had been there. With a dramatic setting, stunning neo-gothic architecture, elegant turrets, an arched stone bridge, cascading waterfalls, green cliffs and a river that gushes 150 feet below the massive church, the Las Lajas Sanctuary is a must-see for even the non-religious. The underground Salt Cathedral of Zipaquirá may be a popular tourist spot, but that doesn’t take away from its beauty. Built two hundred meters deep in a salt mine under a halite mountain near Zipaquirá, this Roman Catholic Church is a place of pilgrimage. There are three sections in the temple to represent stages in the life of Christ, and the ornaments, icons and details in the temple are carved out of halite rock. Considered one of Colombia’s biggest architectural achievements and dubbed a “jewel of modern architecture”, the salt cathedral takes you to a different world – beautiful, glowing, a little eerie and only a short distance from Bogota downtown. The small island of Crab Cay (locally known as Cayo Cangrejo), is located in the Caribbean Sea in the Providencia Island municipality and is a wonderful stretch of paradise without the crowds of many other Colombian beaches. The water is incredibly clear, and though the reef may not have a lot of coral, you can snorkel to discover several species of fish including barracudas and rays. The area is part of a protected natural park (the Parque Nacional Natural (PNN) Old Providence McBean Lagoon), so there is a small fee to enter. Nearby are an airport, a mangrove system, and numerous species of flora and fauna. The Restaurante Deep Blue nearby offers gorgeous views as well as an inventive menu. This mysterious park, listed in UNESCO’s World Heritage List, is South America’s largest group of large stone sculptures and religious monuments. Some Andean peoples who lived in the region between the First and Eighth centuries are believed to have been the creators of the many impressive sculptures of mythical animals and gods. Here you can enjoy wonderful walks, read up a little on the local history in the museum near the entrance, and discover the enigmatic statues that dot the green, cool landscape. The San Agustin Archaeological Park is located in San Agustin, in the southern department of Huila. For an experience of an unforgettable active volcano in Columbia, visit the Nevado del Ruiz volcano between the departments of Tolima and Caldas west of Bogota. Also known as Kumanday among the local indigenous pre-Columbian people, the volcano has been active for 2 million years. Visitors can join a tour group or drive there on their own, as long as the park is open (when activity is not dangerous). The hike up takes you through beautiful natural scenery, flora and fauna, and near the top you can see the blue steam rising from the volcano. Security ensures that you don’t go anywhere unsafe, though you should be prepared for high altitudes and stop frequently for acclimatization along the way. Are you interested in travelling to Colombia? Start your adventure NOW by learning Spanish before you go. Sign up to our FREE 5 week online Spanish course using the form on the right side of this page.